A new format of television broadcasting, Internet Protocol Television(IPTV), suggests new opportunities for advertisers through interactiveadvertising. This article investigated the effectiveness of IPTV advertisingin terms of interactivity and advertising value. In a simulation of IPTV operations,this study developed and tested a structural equation model to examinethe mechanisms of effective IPTV advertising. Results indicated thatinteractivity had a positive effect on advertising value and, in turn, advertisingvalue positively affected attitudes toward advertising. In addition, advertisingvalue was found to have a direct effect on attitudes toward brand. John was watching a basketball game on TV. At a moment when a player made a skillful move, he recognized a red dot on the screen with saying if you want information about the player's basketball shoes, press the red button on your remote. Thinking about his worn-out basketball shoes, John pressed the red button and it led him to a brand page of basketball shoes. After browsing several pages in the micro-site of the brand, John printed out a discount coupon for a basketball shoe, then he went back to watch the game again. At least since 1990s, this kind of scenario has been expected as the scenes of future TV and advertising (Cuniff 1993; Hoffman & Novak 1996). In fact, recent media technologies enable viewers to interact with video content through various television platforms, including Internet broad-band, satellite, and digital cable (Bellman, Schweda & Varan 2009; Cauberghe & Pelsmacker 2006/2008; Jensen 2005). Contrasting inter-active television with traditional television, Cauberghe & Pelsmacker (2006) list various factors that are key characteristics of interactive tele-vision, including two-way communication, active users, time-shifting, ubiquitous, narrowcasting, and ad-skipping. The market size of interactive television has been increased with grow-ing numbers of providers and platforms. An industrial report (Multimedia Research Group 2010) estimates that 28 million people in the global market are currently subscribing to interactive television services, and that that number will nearly triple to 83 million in 2013. In addition, global market revenues from interactive television will more than triple, from $12 billion in 2009 to $38 billion in 2013. In recent years, some prominent companies from information technology sectors joined the interactive television market. For example, Apple and Yahoo have their own services for inter-active television. Lately, Google announced to provide interactive formats of television service named as Google TV (Patel 2010). In spite of its steady growth in the market size, there have been industrial skepticisms about the success of interactive television (e.g. Ries 2004; Dudar 2010). One of major concerns behind the skepticisms is that TV viewer will not adopt interactive TV because they cling to their current be-haviors and patterns to watch televisions as a lean back medium so they are not willing to interact with televisions and its contents. In fact, several cases of early businesses under the concept of interactive television from the 90s such as WebTV and AOLTV failed to capture the majority of tele-vision audiences (Ries 2004). In addition, an academic survey (Cauberghe & De Pelsmacker 2006) with advertising practitioners identified technical and perceptual hurdles to create effective advertising through interactive television. Therefore, understanding consumer's usages of interactive television and potential mechanisms to process advertising through interactive tele-vision are important issues to predict the success of interactive television and also it can increase our theoretical knowledge about the effectiveness of interactive advertising in the new context. In addition, this knowledge can contribute to practitioners to run more effective advertising practices through interactive televisions. Media researchers have used terms such as interactive television (iTV) (e.g. Bellman, Schweda & Varan 2009) and interactive digital television (IDTV) (e.g. Cauberghe & Pelsmacker 2006) to indicate the interactive nature of these new types of television. As specific cases of interactive tele-vision, IPTV indicate that television signal transmissions for these inter-actions use the Internet platform. The International Telecommunication Union (ITU 2006) defines IPTV as multimedia services such as tele-vision/video/audio/text/graphics/data delivered over IP based networks managed to provide the required level of Quality of Service (QoS)/Quality of Experience (QoE), security, interactivity, and reliability. This new for-mat of television can change people's patterns and experience of television viewing. For example, IPTV viewers may be able to look up a sports play-er's statistics or control the camera angle while watching a football game, access photos or songs from their PC and play them on their televisions, use wireless phones to schedule a recording of their favorite shows, or click an advertising button on a television commercial to see more detailed in-formation from the advertisement. For advertisers, IPTV offers several ad-vantages over traditional television (Bellman et al. 2009; Cauberghe & Pelsmacker 2006; Jensen 2005). One of the most promising advantages of IPTV for advertisers is that they use many of new interactive formats of advertising that are not available with traditional television commercials (Berte, Vyncke & Bens 2010). Academic research on the effectiveness of IPTV advertising needs to ensure that both advertisers and viewers under-stand the potential and optimal usage of this new medium. However, few studies have examined the relationship between interactivity and effec-tiveness of advertisements in the context of IPTV advertising. Several stud-ies have investigated the effects of interactivity in other types of interactive media, such as the Internet. Wu (2005) found a positive relationship be-tween users' perceptions of interactivity and their attitudes toward the Web. McMillan & Hwang (2002) identified three dimensions of inter-activitytwo-way communication, user control, and time delayand Liu (2003) confirmed that active control, two-way communication, and syn-chronicity are three independent, yet correlated dimensions of interactivity. Ducoffe (1996) shows a positive association between adver-tising value and attitude toward Web advertising, suggesting that people who rate Web advertising as having high value tend to have favorable atti-tudes toward the Web advertising. However, while advertising value and interactivity were identified with potential antecedents of attitudes toward the advertising embedded in the interactive medium, researchers have rare-ly examined the relative influence of these two variables on attitudes to-ward IPTV advertising. Thus, exploring the relationship between inter-activity, advertising value perceptions, and attitudes toward IPTV adver-tising is important to understand the underlying mechanism how IPTV ad-vertising works. The purpose of the current study is to understand how consumers perceive IPTV advertisements and how they form attitudes toward IPTV advertisements. Specifically, this study examines the impact of interactivity and advertising value on attitudes toward IPTV advertising. The study em-ploys a series of simulated IPTV advertisements to observe how consumers interact with those stimuli and measure their perceptual and attitudinal responses. The results of the study have several implications for academic researchers and advertisers, and the underlying mechanisms concerning the link between interactivity and attitudes toward advertising can contribute to the theoretical understanding of consumers' processing of IPTV advertising. Internet Protocol TV (e.g. IPTV), the merging of the Internet and TV, has been launched in most Western countries and East Asia, such as Hong Kong, Japan, and S. Korea. IPTV in its essence combines broadcast content (multimedia content) with interactivity. This multimedia content is dis-tributed via broadband networks (Cauberghe & Pelsmacker 2008). IPTV is exposed on different end devices, such as a TV. Some applications in IPTV such as video on demand blurred the line between a TV and a PC. Another potential for the IPTV technology makes programs more inter-active for the viewers. For example, viewers can enjoy a real time live quiz program using interactive IPTV interface. Many definitions of IPTV em-phasized the interactive nature of IPTV services such as the Interactive Program Guide, enhanced broadcasting, web browsing, Video on Demand, and communication services. Different characteristics between traditional television and IPTV are one way communication vs. two way communication, passive viewer vs. active viewer, Push model vs. pull model, and time restricted vs. time shifting and so on. IPTV has been often conceptualized as the convergence of traditional TV and the Internet. As presented in Table 1 (Cauberghe & Pelsmacker 2010), IPTV has the strengths of both media as an advertising channel. When comparing the characteristics of advertising on IPTV with tradi-tional commercials and Internet, IPTV has new types of interactive advertising. Three basic types of interactive advertising have frequently appeared in the previous literature (e.g. Bellman et al. 2009; Berte et al. 2010; Cauberghe & Pelsmacker 2006/2008; Reading, Bellman, Varan & Winzar 2006): impulse response format ads, dedicated advertiser location (DAL) ads, and telescopic ads (also known as Video Advertiser Location ads). The impulse response format refers to the advertisements that trigger viewers to interact with commercials by presenting banners on the screen during the television program. Viewers can access DAL, a micro-site for advertisers that is similar to a webpage that contains products, information, and brand messages, using remote controls while watching or browsing television programs to order product brochures, samples or products. Telescopic ads refer to a commercial within a commercial, where consum-ers can view an extended version of the commercial and obtain more in-formation about the advertised products by clicking specific buttons on the remote control during television commercials (see Bellman et al. 2009). All three formats of IPTV advertising differentiate themselves from tradi-tional television commercials because of their interactive features pre-sented during television programs or commercials. Recently, several empirical studies have investigated the effectiveness of IPTV advertising over traditional television commercials. Cauberghe & Pelsmacker (2006) showed that users perceive two-way communica-tion, specific targeting, and product information as the advantages of inter-active TV advertising, even though the general levels of knowledge and interest of participants in IPTV were limited. Reading & Bellman (2006) compared a series of telescopic advertising with the traditional format of television commercials and suggested that telescopic advertising would generate more favorable attitudes toward advertisements and advertised brands. These results were in line with a Bellman & Schweda's (2009) study, which compared the three types of IPTV ads with traditional tele-vision ads. Another stream of research related to IPTV ads investigated the effects on attention and memory of simultaneous exposure to television content and interactive advertising. Cauberghe & Pelsmacker (2008) showed that IPTV advertising is less effective when consumers interact with content other than the advertising (e.g., a puzzle). Cauberghe & Pelsmacker(2008) maintained that the detrimental effects of interaction with the program con-tent might be due to the limited capacity of cognitive activity. On the other hand, some researchers (Cauberghe, Pelsmacker & Janssens 2009; Giotis & Lekaks 2009) have found that interactive advertising is more effective when the advertised products are congruent with the content of the tele-vision program. In sum, previous research on IPTV advertising has sug-gested that the new formats and enhanced interactivity of IPTV advertising can provide new opportunities for advertisers and that interactivity is a fac-tor in the effectiveness of IPTV advertising. Since the early stage of Internet advertising, researchers have proposed and tested the concept of interactivity as a critical antecedent of effective Internet advertising (e.g., Bezjian-Avery, Calder & Iacobucci 1998; Cho & Leckenby 1999; Jee & Lee 2002; Coyle & Thorson 2001; Ko, Cho & Roberts 2005; Liu & Shrum 2002; Macias 2003; Rosenkrans 2009; Sundar & Kim 2005). Several empirical studies (Cho 1999; Coyle & Thorson 2001; Macias 2003; Sundar & Kim 2005) have manipulated levels of inter-activity in Internet advertising to demonstrate that higher levels of inter-activity in Internet advertising can produce more positive attitudes toward advertising and brands. To the best of our knowledge, however, few empiri-cal studies have applied and tested these findings in the IPTV context. Although different scholars have proposed different sets of interactivity definitions, the common recurring theme is interactivity can be defined as user's ability to control over information. McMillan & Hwang (2002) offered a wide review of interactivity and classified interactivity as (1) process, (2) feature, (3) perception, and (4) combination of process, fea-ture, and/or perception. Wu (2005) also classified it as actual interactivity and perceived interactivity. Actual interactivity focuses on the feature of media or capabilities of creating interactive content or message or potential for interaction in general. Perceived interactivity is a psychological state experienced by a site-visitor during the interaction process. It has three di-mensions: (1) perceived control over (a) site navigation; (b) the pace or rhythm of the interaction; (c) the content being accessed, (2) perceived re-sponsiveness from (a) the site-owner; (b) from the navigation cues and signs; (c) the persons online, (3) perceived personalization of the site with regard to (a) acting as if it were a person; (b) acting as if it wants to know the site visitors; and (c) acting as if it understands the site visitor (Wu, 2000). In general, perceived interactivity will have an impact on the effects of ac-tual interactivity on consumers' attitudes and behaviors. Rafaeli & Ariel (2007) summarized interactivity as synchronicity, control, rapidity and speed, participation, choice variety, directionality, hypertextuality, con-nectedness, experience and finally responsiveness. Through the literature, they identified distinction between a focus on functions of features and a focus on users. A focus on function leads to claims that interactivity is an attribute of technology. Steuer (1992) defines interactivity as the extent to which users can participate in modifying the form and content of a medi-ated environment in real time. He viewed interactivity as a feature of the medium. Contrary to this, Rogers defines interactivity as users' control un-der which participants in communication process can exchange roles. Among this literature, interactivity in this paper can be defined as a percep-tion experienced by a participants during interaction process. This study proposes that interactivity has three dimensions: control, personalization, and participation. Control is related to a wide range of means to manipulate the content. As for the personalization factor, IPTV can send personalized messages to consumers. Personalized messages in-clude what consumers want to know and what they want to buy. IPTV ad-vertising has the potential to ensure that consumers receive relevant mes-sages (Pavlou & Stewart, 2010). Participation has been widely used as a means of improving advertising effectiveness (Stewart & Ward, 1994). IPTV advertising offers options for consumers' participation. IPTV adver-tising focuses on involving consumers in the advertising and purchase process by allowing them to participate in their search process. For exam-ple, IPTV helps consumers identify the specific product of their choice based on their preference. In an early study of Internet advertising, Ducoffe (1996) extended his earlier model for advertising value (Ducoffe 1995) into the domain of Internet advertising, and he identified three conceptsentertainment, in-formativeness, and irritationas determinants of advertising value perception. In addition, in his model, advertising value positively affects attitudes toward Internet advertising. The current study posits that these three concepts of advertising value may be related to the interactivity of IPTV advertising. First, the interactivity of IPTV advertising may increase the entertainment value of the advertisement. Hoffman and Novak (1996) proposed that consumers' interactions with computer-mediated content create a feeling of playfulness. Also, interactivity plays a role in creating the attraction of networks and in generating their growth (Rafeli & Sudweeks 1997). This line of thought leads to the presumption that con-sumers may experience feelings of playfulness or attraction during the in-teraction with IPTV and, as a result, perceive the IPTV advertising as hav-ing entertainment value. Second, as is the case with Internet advertising, interactions with IPTV advertising enable consumers to search for addi-tional information based on their own interests (Ko, Cho & Roberts 2005), which may enhance the perception of IPTV advertising's information value. Finally, in some cases, the interaction with IPTV advertising in-creases feelings of irritation, especially when it interrupts consumption of other editorial content. In fact, many studies have found that irritation (or intrusiveness) is a main cause of consumers' avoiding interactions with Internet advertising (Cho & Cheon 2004; Edwards, Li & Lee 2002; Ying, Korneliussen & Grnhaug 2009). Therefore, if consumers find interactions with IPTV advertising irritating, the value of the IPTV advertising decreases. H1: Interactivity of IPTV ads has an overall positive effect on advertis-ing value. H2: Interactivity has a direct positive effect on attitudes toward IPTV advertising. Ducoffe (1996) examined the relationship between advertising value and attitude toward advertising. He expected that the two constructs would be strongly associated. People rating Internet advertising high in its value would tend to hold favorable attitude toward Internet advertising. 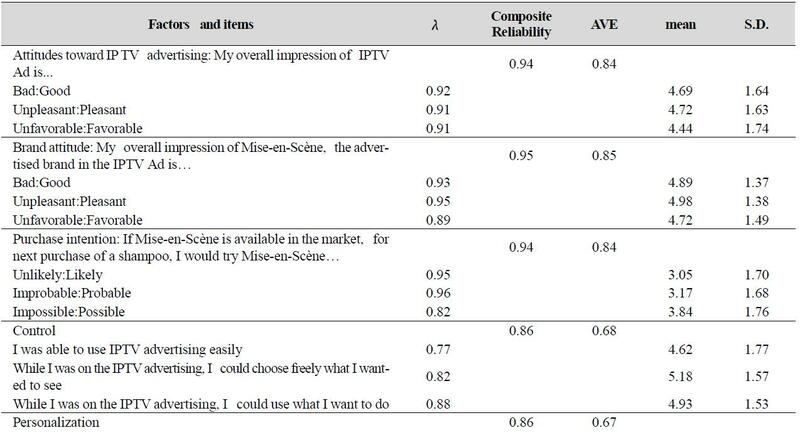 The con-struct of advertising value (Ducoffe 1996) positively affects attitudes to-ward Internet advertising, so the same logic can be applied to the IPTV context in the current study. H3: Advertising value has a direct positive effect on attitudes toward IPTV advertising. Established relationships between attitudes toward advertising and at-titudes toward the brand and purchase intention have been well docu-mented in prior literature (Brown & Stayman 1992; MacKenzie & Lutz 1989). Previous studies have consistently found linear relationships be-tween attitudes toward advertising and the brand, and purchase intention within various contexts, including Internet advertising (e.g., Ko et al. 2005; Cho & Leckenby 1999). Increased interactivity on a website has positive effects on users' perceived satisfaction, effectiveness, efficiency, value and overall attitude toward a website (Teo et. al., 2003). Macias (2003) found that interactive advertising has a positive influence on consumers' percep-tions of brands and advertising. In several empiricalstudies, the effects of interactivity had reached attitude toward brand or product and purchase intention or revisit intention (Wu 2005). Thus, the current study expects that these relationships occur with the same patterns in the context of IPTV advertising. The proposed hypotheses are included in the structural model shown in Figure 1. H4: Positive attitudes toward IPTV advertising have a positive effect on attitudes toward the brand. H5: Positive attitudes toward the brand have a positive effect on pur-chase intention. The current study used self-administered surveys and a computer lab experiment to obtain empirical data on users' attitudes toward IPTV adver-tising and its antecedents. Participants viewed an example of IPTV adver-tising before they completed a questionnaire on attitudes and correlates of IPTV advertising acceptance. The survey method in a forced exposure context is a commonly used method in studies on the effectiveness of inter-active advertising (Appiah 2006; Reading et al. 2006; Sundar & Kim 2005). This study employed this method because IPTV advertising is relatively new in the United States, so recruiting participants who have experience with IPTV advertising is difficult. Participants in the current study were students who were majoring in fields other than advertising in a large southeastern university in the United States. Participants volunteered for a 30-minute session. The computer lab was equipped with eighteen laptops and headsets, and the number of partic-ipants varied from five to eighteen in each session. Each session consisted of three sub-sessions: a demonstration of IPTV operations, a task com-pletion, and a survey session. A researcher instructed participants on how to operate the IPTV on the laptop computer and how to view an ex-perimental brand page. Following the demonstration session, participants were asked to complete four tasks on the brand page (1) gather information about a shampoo product, (2) join a promotional event by entering a hypo-thetical phone number, (3) play and watch a 20-second commercial videoclip embedded in the brand destination page, and (4) simulate the purchase process. Participants spent as much time as they needed to complete these tasks. Once the participants completed the tasks, they answered a series of questions on the IPTV advertising they had experienced and then were dismissed. Most participants finished all three sub-sessions within 30 minutes. Two hundred fifty-seven undergraduate students participated in the study. Of these, 37% (n = 94) were male and 63% (n = 123) were female. Respondents' ages ranged from 18 to 29, with a median age of 20 years. The current study used two versions of the experimental IPTV advertis-ing, one to demonstrate how to operate the IPTV, and the other for the main task completion. The experimental IPTV was simulated on the computer screen and it was operated through the simulated remote control on the com-puter screen. Shampoo was used in the IPTV advertising stimulus because it has been considered generally relevant to college students and moder-ately involvement product. Attitude toward the ad research has been using non-durable goods such as shampoo, facial tissues, cola, tooth pastes as the advertised product in the studies (Mitchell & Olson 1981; Shimp 1981). Our data indicated the mean of shampoo involvement was 4.58 (sd=1.55) in the seven point scales. The appendix shows the sample images of the stimuli. The IPTV advertising used for the task completion stage consists of three types of IPTV advertising: impulse response formats, DAL ads, and telescopic ads. Once the IPTV set was turned on, a Korean quiz show played, and the electronic program guide banner appeared at the bottom of the screen. Participants were directed to select one of the menus in the electronic program guide and then were exposed to a Korean movie scene. After a few seconds, the experimental banner in the impulse response for-mat, which appeared in the upper-left-hand corner of the Korean movie, could be clicked by using the remote control. Clicking the banner led to the dedicated advertiser location (the brand page) on the IPTV screen. Telescopic ads were also inserted in the dedicated advertiser location. These three types of IPTV advertising provided comprehensive experi-ences with experimental IPTV advertising. The IPTV program used in the experimental IPTV stimulus was in Korean but the advertised brand and brand page was translated into English. The experimental brand page and questionnaire were developed using a translation and back-translation method with two bilingual speakers. The brand used in the current study was unknown to the participants in order to rule out brand familiarity and bias and because the use of foreign editorial content excludes the potential effects of program involvement in studying the effectiveness of embedded advertising such as irritation perception. All factor loadings for observed items, their descriptive statistics, and reliabilities for constructs are shown in Table 2. The questionnaire used to measure attitudes toward IPTV advertising and brand is from the Attitudes toward Advertising measure used by Lutz (1985) and Muheling (1987). The purchase intention measure applies the scales in Lutz, MacKenzie and Belch's (1983) study. The control measures for three sub-dimensions of interactivity are from Liu (2003) and Wu (2000), the participation measures are from Babin et al. (1994) and Liu & Arnett (2000), and the personalization measures are from Srinivasan, Anderson & Ponnavolu (2002). The measures of perceptions of adverting val-ueinformativeness, entertainment, and irritationapplies the scales in Ducoffe's (1996) study. Structural equation modeling was used to estimate the hypothesized model among the constructs, and the correlation matrix of 257 respondents was used to estimate the structural equation model. There were no missing data. Following the two-step approach proposed by Anderson & Gerbing (1998), this study estimated a measurement model prior to examining the structural model relationships. Both the measurement and model and si-multaneous equation model were estimated with LISREL 8.80 using the method of maximum likelihood. Given an acceptable measurement model, the optimal structural equation model was identified by way of model com-parison tests (also known as 2 difference tests). Two antecedents contributing to attitudes toward IPTV adverti-singinteractivity and perception of valuewere hypothesized. Prior research (Babin and Darden 1994; Ducoffe 1996; Liu 2003; Srinivasan, Anderson and Ponnavolu 2002) has postulated that interactivity has three sub-di-mensionscontrol, participation, and personalizationand that perceptions of advertising value also have three sub-dimensions: informativeness, en-tertainment, and irritation. 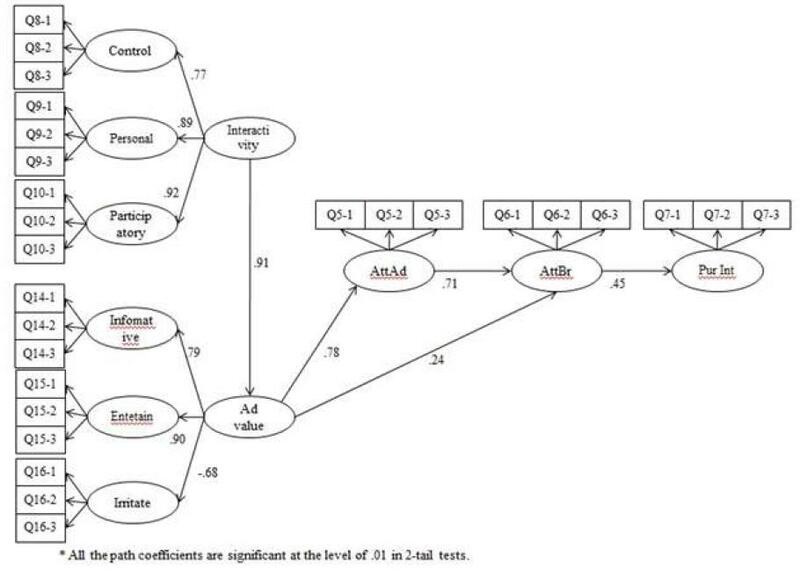 To test the hypothesized structure of the contrib-utors to attitude toward IPTV advertising (see Figure 1), this study analyzed a second-order hierarchical confirmatory factor analysis for the measure-ment model. This analysis helps to simplify the structural nature of the ante-cedent to attitude toward IPTV advertising. The measurement model was selected on the basis of the good-ness-of-fit indices (see Table 3). The final measurement model (2 (308) = 572.14 (p > .05)) fit the data well, and the key goodness-of-fit indices (SRMR = .047, RMSEA = .059, TLI = .98, CFI = .99) met the conventional cut-points (SRMR = .09, RMSEA = .06, CFI = .95, TFI = .95). In addition, all factor loadings were above 0.5 and were significant at the 0.01 level, as presented in Table 2. As for the evidence of convergent validity, average variance extracted for each construct was found to exceed .50 for a con-struct (Fornell & Larcker, 1981). The AVE for all latent variables was larger than its squared correlations (Table 2), suggesting that the measures were considered to possess discriminant validity. In addition, pairwise X2 dif-ference tests showed that all correlations between factors were sig-nificantly different from 1.0. The hypothesized relationships among the latent constructs were en-tered based on the finalized measurement model. To test whether estimat-ing the simultaneous equation model resulted degraded fit, this study per-formed a model comparison test between the fit of the simultaneous equa-tion model and the fit of the measurement model. The test showed that 2 diff = 2structural model - 2measurement model = 591.76 - 572.14 = 19.62, and the degrees of freedom were dfdiff = dfstructural model - dfmeasure-ment model = 313 308 = 5. Since the critical value of 2.05,5 was 11.07, and model comparison test indicated that the original model significantly decreased the fit of the measurement model, the simultaneous model was rejected in favor of the measurement model. The examination of the mod-ification index suggested that the perceived advertising value of IPTV may have influenced attitudes toward the brand, although this result was not hypothesized. The perception that IPTV advertising was less irritating and more informative and entertaining led to favorable attitudes toward the advertised brand. However, the hypothesized relationship between in-teractivity and attitude toward IPTV advertising was not significant. The model fit improved when the path from interactivity to attitude toward the ad was removed and the path from the value perception factor of IPTV ad-vertising to brand attitude was added. The model comparison test con-firmed the improved model fitness. Given the same degrees of freedom (one path removed and one path added, thus the degree of freedom re-mained the same), a minimum fit function chi-square improved from 591.76 to 584.70. H1 predicted the influence of interactivity on perceived advertising value. The path coefficient from interactivity to perceived advertising val-ue was significant ( = .91, p < .001), so H1 was supported. H2 and H3 pro-posed that interactivity and advertising value influenced attitude toward IPTV advertising, respectively. H2 was not supported because the path co-efficient from interactivity to attitude toward IPTV advertising was not significant ( = -.13, p > .05) and because the original path model did not fit the data well. The revised model suggested that advertising value sig-nificantly influenced attitude toward IPTV advertising ( = .78, p < .001) so H3 was supported. In light of the non-significant relationship between interactivity and attitude toward IPTV advertising, advertising value ap-peared to play a mediating role between interactivity and attitude toward IPTV advertising. 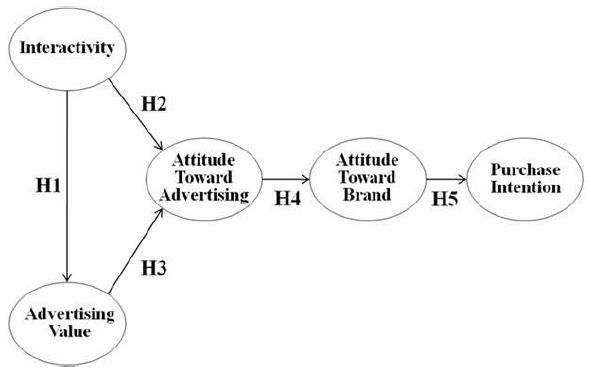 H4, which predicted the path from attitude toward IPTV advertising to brand attitude, was supported ( = .71, p < .001). The literature in the adver-tising field has suggested that evaluation of an advertisement is often trans-ferred to brand evaluation (Lutz 1985; MacKenzie & Lutz 1989), and the findings of the current study suggest that this prevalent hypothesis was con-firmed in the context of IPTV advertising. The revised model also con-firmed a significant influence of brand attitude on purchase intention (H5). The current study identifies interactivity and advertising value as the two primary antecedents of attitude toward IPTV and empirically tests the relationships among the variables. First, the study finds that advertising value has a significant effect on attitude toward IPTV advertising and atti-tude toward brand. The study also finds, albeit unexpectedly, that advertis-ing value influences attitude toward the brand, which is contrary to findings related to Web advertising, so advertising value yielded a different function in IPTV advertising. This result may be due to the entertainment effects of IPTV advertising since participants may have been seeing an example IPTV advertising for the first time when they participated in this study, and the novelty of interaction with a new format of advertising, even forced interaction, may have influenced attitudes toward brands via the entertain-ment construct. Second, this study shows that interactivity influences atti-tudes toward IPTV advertising, although no direct relationships appear be-tween interactivity and attitude toward IPTV advertising. Instead, inter-activity has an indirect effect on attitudes toward IPTV via advertising value. The finding suggests a mediating role of advertising value in the context of IPTV advertising. While interactivity is often an important fac-tor in increasing the benefits of IPTV advertising, in the current study inter-activity in itself does not appear to directly influence attitude toward IPTV advertising. Our findings suggest that advertising value perceptions may mediate the effects of interactivity on attitudes toward the ad and brand attitudes. Interactivity in itself does not affect attitudes toward the ad. Rather, interactivity seems to reach attitudes toward the ad only when users perceive the advertisements beneficial and valuable. The mediating role of advertising value perception gains some insights into the inconsistent results in the previous literature. There have been mixed results on the ef-fects of interactivity on advertising outcome variables such as recall, atti-tudes toward the ad, and brand attitudes. On stream of research on inter-activity focuses on the effects of interactivity as structural feature (Bezjian-Avery, Calder, & Iacobucci 1998; Cauberghe & De Pelsmacker 2008, 2010; Sundar, Brown, & Kalyanaraman 1999) while another stream of research investigated the effects of interactivity as a user experience or perception (Cho & Leckenby 1999; Ko, Cho & Roberts 2005; Yoo & Stout 2001). The former type of experimental studies, by and large, manipulated the level of interactivity by varying the interactive features such as click-able links, the levels of layers in destination sites and then measured and compared the advertising outcome variables. Cauberghe & De Pelsmacker (2010) found a higher level of interactivity has a positive effect on time spent in the DAL, brand recall, and attitude toward the brand. On the other hand, Bezjian-Avery, Calder, & Iacobucci (1998) found that interactivity actually had a detrimental effect. Those in the interactive condition spent less time viewing the ads and indi-cated less of an intention to purchase the product. Sundar, Brown, & Kalyanaraman (1999) found that the partic-ipants in the high interactivity condition judged the political candidate as less caring and less qualified than did those in either the moderate or low interactivity condition. In a review article, Liu & Shrum (2002) pointed out that the inconsistent results might stem from differences in users' goal orientation induced by different manipulation tasks. Interactivity features might positively influence attitudes toward the ad and brand attitudes to the extent that they provide actual benefits of using the features. Third, the study also finds evidence of the established linear relation-ship between attitude toward advertising and brand, and purchase intention in the IPTV advertising context. As proven in numbers of Internet advertis-ing studies (e.g. Cho 1999; Coyle & Thorson 2001; Macias 2003; Sundar & Kim 2005), attitude toward an advertisement is a valid measure of the effectiveness of IPTV advertising. Fourth, a second-order confirmatory factor analysis confirms the di-mensions of interactivity and advertising value. While prior literature has defined interactivity in many different ways, the current study finds that the three sub-dimensions of personalization, participation, and control ac-count for interactivity. Advertising value (informativeness, entertainment and irritation), as proposed by Ducoffe (1996), is also confirmed in the cur-rent study in that the advertising value of Web advertising applies to IPTV advertising. Fifth, the structural model proposed in this study represents the IPTV advertising process shown in Figure 2. The first factor for processing IPTV advertising is interactivity. As posited in the proposed model, the inter-activity of IPTV advertising is a key to initiating a positive attitude toward IPTV advertising. For example, the degree of control consumers have when they operate IPTV advertising in pursuit of their own goals is a critical factor in the effectiveness of IPTV advertising. Therefore, consumers' per-ceptions about control, personification, and participation are the most im-portant factors in the development of interactivity. Results of the current study suggest that the interactive features of IPTV advertising generate positive attitudes toward brand and purchase intention via advertising value and attitudes toward the advertisement. Interactivity appears to be an important and unique factor in that it initiates positive re-actions and leads to positive attitudes toward the advertisement. However, practitioners need to note that interactivity in itself may not always result in positive attitudes toward advertising. The results highlight the mediating role of advertising value in the effectiveness of interactive characteristic, so practitioners should keep irritation as low as possible while enhancing the interactive features of personalization and customization. The key point for IPTV advertising is the interactivity, which is an effec-tive way to increase the effectiveness of IPTV advertising. For consumers to feel the value of interactivity, they must be free to enter and operate IPTV advertising. For example, when consumers view a program in IPTV, they should not have difficulty figuring out how to use menus and options for the advertisement. Informativeness and entertainment are still important factors for pro-ducing positive attitudes toward IPTV advertising, just as they are with traditional advertising. In pursuit of these two factors, advertisers may de-velop advertising that contains multimedia content, including music, pre-views, chatting capabilities, and product information. For example, an au-tomobile manufacturer might develop informative advertising about ve-hicle care or safe driving, which also allows consumers to surf throughout the IPTV advertisement for more information. However, advertisers also need to consider the irritation factor and establish the threshold of advertis-ing information before irritation results. In addition, brand advertising that is congruent with a television program may reduce irritation and should also be taken into consideration in future research (Cauberghe et al. 2009). This study has several limitations and, at the same time, suggests mean-ingful directions for future research. First, the artificiality of lab environ-ment in this study is among a few limitations of this study. The instructions for IPTV advertising stimuli might lower the irritation perception. Thus, the study might underestimate the effects of irritation perceptions in IPTV advertising experience. However, it is somewhat unavoidable in examin-ing the effectiveness of innovative formats of advertising such as IPTV advertising. Second, the study used a single product for the experimental advertising stimulus, so the findings in this study may not be generalizable to other product categories. Future investigations may consider testing a wider variety of advertisements from different product categories. Third, this study used only one type of program, although the inclination to interact with an embedded advertisement is likely to differ across program genres. Individual differences in program involvement, even for the same pro-gram, may also affect the interactive response. Further studies should in-vestigate the effects of program genre and individual differences on the effectiveness of IPTV advertising. Fourth, generalization of the results in the present study is difficult because the sample population may not be rep-resentative of those using IPTV. Although students are one part of the pop-ulation that will use IPTV, future study should expand the type of participants. Finally, this study tests two variable, interactivity and adver-tising value, but future studies should consider other variables, such as source credibility and prior brand attitude. 1.Anderson, J.C., & Gerbing, D.W. (1998). Structural Equation Modeling in Practice: a Review and Recommended Two-step Approach. Psychological Bulletin, 103(3), 411-423. 2.Appiah, O. (2006). Rich Media, Poor Media: The Impact of Audio/video vs. Text/picture Testimonial Ads on Browsers' Evaluations of Commercial Web Sites and Online Products. Journal of Current Issues and Research in Advertising, 28(1), 73-86. 3.Babin, B.J., William, R.D. & Mitch G. (1994). Work and/or Fun: Measuring Hedonic and Utilitarian Shopping Value. Journal of Consumer Research, 14(6), 644-656. 4.Bellman, S., Schweda, A. & Varan, D. (2009). A Comparison of Three Interactive television Ad Formats. Journal of Interactive Advertising, 10(1), 14-34. 5.Berte, K., P. Vyncke & E. De Bens (2010). Opportunities of Interactive Formats for Innovative Advertising on Digital Television. In Proceedings of the 8th International Interactive Conference on Interactive TV&Video, Tampere, Finland, 55-58. 6.Bezjian-Avery, A., Calder, B & Iacobucci, D. (1998). New Media Interactive Advertising vs. Traditional Advertising. Journal of Advertising Research, 38(4), 23-32. 7.Brown, S. P. & Stayman, D. M. (1992). Antecedents and Consequences of Attitude toward the Ad: A meta-Analysis. Journal of Consumer Research, 19(June), 34-51. 8.Cauberghe, V. & De Pelsmacker, P. (2006). Opportunities and Thresholds for Advertising on Interactive Digital TV: A View from Advertising Professionals. Journal of Interactive Advertising, 7(1), 12-23. 9.Cauberghe, V. & De Pelsmacker, P. (2008). The Advertising Impact of an Interactive TV Program on the Recall of an Embedded Commercial. Journal of Advertising Research, 48(3), 352-362. 10.Cauberghe, V., De Pelsmacker, P., & Wim, J. (2009). Simultaneous Exposure to a Program and Advertising Content in an Interactive Context: Perceptual and Semantic Interference and Reinforcement. Journal of Business Research, 63, 972-979. 11.Cauberghe, V. & De Pelsmacker, P. (2010). The Effectiveness of Telescopic Ads Delivered Via Interactive Digital Television: The Impact of the Amount of Information and the Level of Interactivity on Brand Responses. Journal of Interactive Marketing, 24 (4), 297308. 12.Cho, C.H. (1999). How Advertising Works on the WWW: Modified Elaboration Likelihood Model. Journal of Current Issues and Research in Advertising, 21(1), 33-50. 13.Cho, C.H. & Cheon, H.J. (2004). Why do People Avoid Advertising on the Internet. Journal of Advertising, 33(4), 89-97. 14.Cho, C.H. & John, D.L. (1999). Interactivity as a Measure of Advertising Effectiveness. In Proceedings of the 1999 Conference of the American Academy of Advertising, M. S. Roberts, eds. Gainesville, FL: American Academy of Advertising, 162-179. 15.Coyle, J.R. & Esther, T. (2001). The Effects of Progressive Levels of Interactivity and Vividness in Web Marketing Sites. Journal of Advertising, 30(3), 65-77. 16.Cuniff, T. (1993). The Second Creative Revolution; Interactive Advertising on Television Offers the Greatest Challenge Yet. Advertising Age, 22. 17.Ducoffe, R. H. (1995). How Consumers Assess the Value of Advertising. Journal of Current Issues and Research in Advertising, 17(1), 1-18. 18.Ducoffe, R.H. (1996). Advertising Value and Advertising on the Web. Journal of Advertising Research, 36(5), 21-35. 19.Dudar, E. (2010). Five Reasons Consumers Won't Tune in to Google TV. Advertising Age; Retrieved September 18, 2010, from http://adage.com/digitalnext/article?article_id=144060. 20.Edwards, S.M., Hairong, .L & Lee, J.H. (2002). Forced Exposure and Psychological Reactance: Antecedents and Consequences of the Perceived Intrusiveness of Pop-up ads. Journal of Advertising, 31(3), 83-95. 21.Giotis, P. & Lekaks, G. (2009). Effectiveness of Interactive Advertising Presentation Models. In Proceedings of the seventh European conference on European Interactive Television Conference (pp. 157-160). 22.Hoffman, D.L. & Thomas P.N. (1996). Marketing in Hypermedia Computer-mediated Environments: Conceptual Foundations. Journal of Marketing, 60(3), 5068. 23.International Telecommunication Union. (2010). ITU-T Newslog IPTV Standardization on Track say Industry Experts, 2006, from http://ww w.itu.int/ITU-T/newslog/IPTV+ Standardization+On+Track+Say+ Industry+Experts.aspx (accessed July 5, 2010). 24.Jee, J.H. & Lee, W.N. (2002). Antecedents and Consequences of Perceived Interactivity: An Exploratory Study. Journal of Interactive Advertising, 3(1), 34-45. 25.Jensen, J.F. (2005). Interactive Television: New Genres, New Format, New Contents. In Proceedings of the Second Australasian Conference on Interactive Entertainment (pp.89-96). 26.Ko, H.J., Cho, C.H. & Roberts, M.S. (2005). Internet Uses and Gratifications: A Structural Equation Model of Interactive Advertising. Journal of Advertising, 34(2), 57-70. 27.Liu, C. & Arnett, K.P. (2000). Exploring the Factors Associated with Web Site Success in the Context of Electronic commerce. Information & Management, 38(1), 22-33. 28.Liu, Y. (2003). Developing a Scale to Measure the Interactivity of Website. Journal of Advertising Research, 43(2), 207-216. 29.Liu, Y. & Shrum, L.J. (2002). What is Interactivity and Is it always Such a Good Thing? Implications of Definition, Person and Situation for the Influence of Interactivity on Advertising Effectiveness. Journal of Advertising, 21(4), 5364. 30.Lutz, R.J. (1985). Affective and Cognitive Antecedents of Attitude toward the Ad: A Conceptual Framework. In Psychological Process and Advertising Effects: Theory, Research and Application, L.F. Alwitt & A.A. Mitchell, eds. Hillsdale, NJ: Lawrence Erlbaum Associates, 45-63. 31.Lutz, R.J., MacKenzie, S.B. & Belch, G.E. (1983). Attitude toward the Ad as a Mediator of Advertising Effectiveness. In Association for Consumer Research, R.P. Bagozzi & A.M. Tybout, eds. vol. 10, Ann Arbor, MI. 532-539. 32.Macias, W. (2003). A Preliminary Structural Equation Model of Comprehension and Persuasion of Interactive Advertising Brand Web Sites. Journal of Interactive Advertising, 3(2), 36-48. 33.MacKenzie, S.B & Lutz, R.J. (1989). An Empirical Examination of the Structural Antecedents of Attitude toward the Ad in an Advertising Pretesting Context. Journal of Marketing. 53(April), 48-65. 34.McMillan, S.J. & Hwang, J.S. (2002). Measures of Perceived Interactivity: An Exploration of the Role of Direction of Communication, User control, and Time in Shaping Perceptions of Interactivity. Journal of Advertising, 31(3), 29-42. 35.Mitchell, A. A., & Olson, J. C. (1981). Are Product a Beliefs the Only Mediator of Advertising Effects on Brand Attitude, Journal of Marketing Research, 18 (August), 318-332. 36.Muheling, D.D. (1987). Comparative Advertising: The Influence of Attitude toward the Ad on Brand Evaluation. Journal of Advertising, 16(4), 43-49. 37.Multimedia Research Group. (2010). IPTV Global Forecast 2010 to 2014. Semiannual IPTV Global Forecast Report 2010. from http://www.mr gco.com/iptv/gf0610.Html (accessed July 5, 2010). 38.Patel, K. (2006). Google TV: What does it Mean for Advertisers? Adage. Thursday, May 20. 39.Pavlou, P & Stewart, D. W. (2000). Measuring the Effects and Effectiveness of Interactive Advertising: A Research Agenda. Journal of Interactive Advertising, 1(1), 62-78. 40.Rackham, N. & Vincintis, J.D. (1999). Rethinking the Sales Force: Redefining Selling to Create and Capture Customer Value. 1st ed., New York: McGraw Hill. 41.Rafaeli, S, & Ariel, Y. (2007). Assessing Interactivity in Computer-Mediated Research. In Oxford, UK: Oxford Unversity Press, Adam N. Joinson, Katelyn Y.A. Mckenna, Tom Postmes & Ulf-Dietrich Reips, eds. 71-88. 42.Rafaeli, S, & Sudweeks, F. (1997). Networked Interactivity, Journal of Computer- Mediated Communication, 2(4), 2: 0. doi: 10.1111/j.1083-6 101.1997.tb00201.x. 43.Reading, N., Bellman, S., Varan, D. & Winzar, H. (2006). Effectiveness of Telescopic Ads delivered via Personal Video Recorders. Journal of Advertising Research, 46(2), 217227. 44.Ries, A. (2004). Why Interactive Television Has No Future. Advertising Age. Retrieved September 18, 2010, from ruby.fgcu.edu/courses/tdugas/IDS3301/acrobat/interactivetvfailure.pdf. 45.Rosenkrans, G. (2009). The Creativeness and Effectiveness of Online Interactive Rich Media Advertising. Journal of Interactive Advertising, 9(2), 18-31. 46.Shimp, T.A., (1981). Attitude Toward The Ad as a Mediator of Consumer Brand Choice, Journal of Advertising, 10 (2), 9-15. 47.Shyam, S.S. & Kim, J.H. (2005). Interactivity and Persuasion: Influencing Attitudes with Information and Involvement. Journal of Interactive Advertising, 5(2), 5-18. 48.Srinivasan, S.S., Anderson, R. & Ponnavolu, K. (2002). Customer Loyalty in e-Commerce: an Exploration of its Antecedents and Consequence. Journal of Retailing, 78(1), 41-50. 49.Steuer, J. (1992). Defining virtual reality: Dimensions Determining Telepresence. Journal of Communication, 42(4), 73-93. 50.Stewart, D.W., & Ward, S. (1994). Media Effects on Advertising. In Hillsdale Media effects: Advances in Theory and Research, J. Bryant. & D. Zillman., eds. NJ: Lawrence Erlbaum, 315-363. 51.Sundar, S.S., Brown,J. & S. Kalyanaraman (1999). Reactivity vs. Interactivity, paper presented at the meeting of the International Communication Association, San Francisco, CA. 52.Teo, H.H., Oh, L.B., Liu, C., & Wei, K.K. (2003). An empirical study of the effects of interactivity on web user attitude. International Journal of Human-Computer Studies, 58(3), 281-305. 53.Wu, G. (2000). The Role of Perceived Interactivity in Interactive Ad Processing. Unpublished dissertation, University of Texas at Austin. 54.Wu, G. (2005). The Mediating Role of Perceived Interactivity in the Effect of Actual Interactivity on Attitude toward the Website. Journal of Interactive Advertising, 5(2), 29-39. 55.Ying, L., Korneliussen, T., & Grnhaug, K. (2009). The Effect of Ad Value, Ad Placement and Ad Execution on the Perceived Intrusiveness of Web Advertisements. International Journal of Advertising, 28(4), 623-638. 56.Yoo, C.Y. & Patricia, A.S. (2001). Factors Affecting Users' Interactivity with the Web Site and the Consequences of Users' Interactivity. Proceedings of the 2001 Conference of the American Academy of Advertising, Charles R. Taylor, ed., Villanova, PA: American Academy of Advertising, 53-61.